What is the best under eye filler for dark circles, saggy eye bags & under eye hollows? The eye is the place that best reflects the beauty of women, but the skin of the eye is 10 times thinner than the skin of other parts of the face, and average daily eye blinks of each person will be about 12,000 times per day. This special physiological structure makes the skin of the eye easy to fatigue and poor blood circulation, making it the most easy to get aging part of the human body. How to tell if a person gets aging? The eyes! What exactly is the reason for aging eyes? 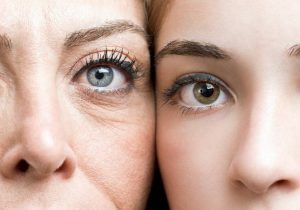 We attributed the three main causes of aging eyes: the culprit to make a person looks tired – dark circles; the first wrinkles on the face – crow’s feet; the first sign of aging, facial area that getting saggy – eye bags。 Crow’s feet， saggy under eye bags and dark circles can easily lose the elasticity and tension of the skin around the eyes, making people looking aging compare to people without such problems even they are at the same age. Having plastic surgery will be a way to fix these problems, however for those who doesn’t want to go under the knife, eye fillers is an alternative way to return your youth without any down times. HP Cell Regation eye filler is an expert in eye bags, dark circles, crow’s feet and eye contours! The soft structure of HP Cell Regation eye filler is injected into the dermis of the skin at the under eye area, which can cover the microvasculars of the dark circles. The effect is just as amazing as applying an concealer to the skin, which can effectively hide the dark circles, and also nourish the skin at the same time. It increases skin’s water retention, tightens around the eyes, reduces dryness of the eye area, and diminishes fine lines around the eyes. 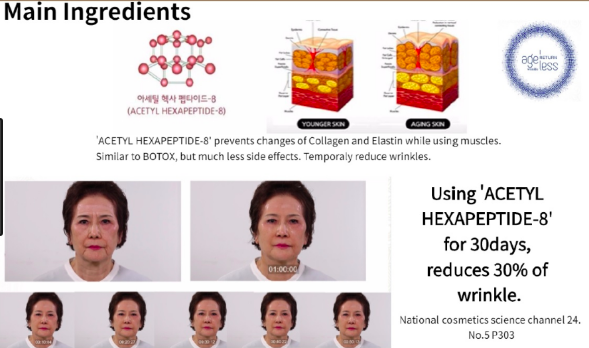 This is what Hyaluronic Acid does, and the amazing part of HP Cell Regation eye filler is that PDRN, also called the Polydeoxyribonucleotide, Pentapeptide-18 and Acetyl Hexapeptide came along with the hyaluronic acid. PDRN (polydeoxyribonucleotide) is the main molecule that exists in all living beings on Earth. It is a polymer with a low molecular weight of 350 kD (average molecular weight) and one of the complexes that make up the cell’s DNA. This is a DNA fragment of a certain size, which promotes tissue regeneration when it is injected into the human body. PDRN stimulates and increases the metabolic activity of cells in the skin called fibroblasts so that to regenerate key components of the skin such as collagen, glycosaminoglycans and glycoproteins. PDRN activates tired aged and damaged cells to act younger and get to work again. It has an anti-inflammatory effect and regenerates tissue by selectively binding in a cell with a specific receptor. In addition, it is a safe substance involved in the synthesis of cells of the human body. Acetyl Hexapeptide-8 (also known under the commercial name Argireline or Acetyl Hexapeptide-3), it is a peptide, a shortened version of a protein consisting of the usual natural amino acids. Like many other peptides, Argirelin was synthesized artificially at the end of the 20th century, and quickly became known in the world of cosmetics as a ingredient that safely relaxes muscles. What makes argirelin? Argireline is a muscle contraction blocker. It allows you to reduce the activity of facial muscles responsible for the formation of wrinkles. Therefore, Argireline is sometimes called a biomimetic peptide. Relaxing mimic wrinkles, Arigirelin has an effect similar to the effect of Botox, albeit in a weakened, but safe manner. At the same time, unlike Botox, whose action is focused on specific muscles, Argirelin is able to relax all the muscles of the face. Like most peptides, acetyl hexapeptide-8 has moisture-binding properties and skin repair properties. What is the mechanism of action Argirelina? Argirelin works on the presynaptic principle. This means that it does not completely block muscle contraction (like Botox), but is embedded between the two processes of the muscle and thus prevents them from touching. There is no transmission of nerve impulses. Therefore, Argirelin is sometimes called a neuropeptide. Need more detail? Argirelin – hexapeptide, that is, a peptide consisting of 6 amino acids. These six amino acids of argirelin repeat a portion of the SNAP25 protein, which is necessary for the binding of the synaptic axon vesicle to the presynaptic membrane. In the axon, argireline competes with the SNAP25 protein and is very often embedded instead in the temporary SNARE protein complex formed from several membrane proteins. The complex is activated immediately before the binding of the vesicle to the membrane for successful exocytosis. The “defective” complex obtained as a result of embedding Argirelin cannot provide the necessary contact of the bubble with the membrane, as a result of which the mediator is not released into the synaptic cleft. Thus, the muscle does not receive a signal of contraction and continues to be in a relaxed state. As a result, the formation of mimic wrinkles is inhibited. Peptides, including Argirelin, have a very powerful preservative effect, preventing the skin from aging further and correcting already acquired defects and deficiencies. The value and advantage of peptides is that they are very small in size – about 1 nanometer, and therefore easily penetrate into the smallest pores (unlike, for example, from collagen). For effective work, a relatively small amount of Argirelin is sufficient – it starts working even in very low concentrations, starting from 0.001%. Note that if you use the drug on the basis of Argirelin for a long time, the skin condition will noticeably improve. If you stop using the tool, the skin remains at the level at which it was at the time of termination of use. There will be no rapid rollback to the previous state. (Pentapeptide) – Polypeptide consisting of 5 amino acids: alanine, glycine, leucithin, phenylalanine, tyrosine. It reduces the depth of wrinkles on the face, especially in the eye area and on the forehead by increasing the production of collagen. Like Acetyl Hexapeptide-8, has a lifting and muscle relaxant effect, however, it achieves the goal through an alternative mechanism of acetylcholine, Pentapeptide -18 reduces the flow of calcium ions through the membrane and reduces the excitation in the neuron; as a result of a decrease in the excitability of the nerve cell, muscle contractions are reduced, which leads to smoothing of mimic wrinkles. Thus, Pentapeptide -18 forms perfect compatibility with argireline and other anti-wrinkle peptides. 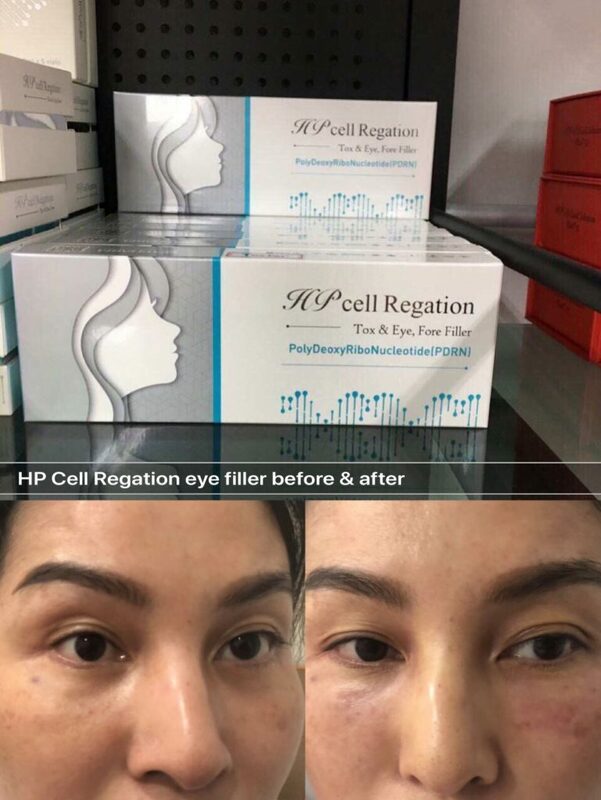 Watch the video for the amazing result with HP Cell Regation Under Eye filler! Immediately effect right after injecting of the under eye filler, hyaluronic acid could hides under eye hollow with a smooth finish. PDRN and peptides within’ the filler could tighten saggy under eye area, reduce wrinkles and regenerate new collagen in the under eye circles, while the hyaluronic acid is getting absorbs by the body after a few months, you still look rejuvenated after the treatment. Now you can finally say good bye to dark under eye circles, it is not just covering anymore, it is an under eye healer that provides an long lasting result. 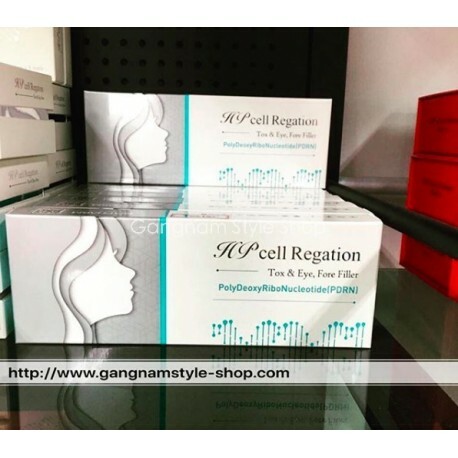 HP Cell Regation is 100% safe and it is approved by KFDA, made in Korea by BR Pharma. HP Cell Regation Tox and Eye filler is designed for filling under eyes and Static wrinkles on your forehead . It includes PDRN, hyaluronic acid, and 26 peptides. Use an cannula to fill the under eye area and perfectly removes wrinkles and dark circles under the eyes. – Skin regeneration – the drug contains PDRN and a complex of 26 peptides that stimulate cell regeneration, skin renewal and elimination of wrinkles from the inside. – Instant effect – removes wrinkles and dark circles under the eyes. The BR Pharm HP Cell Regation Tox & Eye filler contains 3 active ingredients: Polydisoxyribonucleotide + Hyaluronic Acid + Peptide. This composition allows you to remove the already formed creases on the forehead, dark circles, newly formed eye bags, saggy wrinkles under the eyes and prevent the appearance of new ones. This entry was posted in eye bags, eye circles, hp cell regation eye filler, saggy under eye, under eye filler, under eye hollow and tagged dark circle, eye filler, hp cell, hp cell regation eye filler, hpcell regation, saggy under eye, Teosyal, Teosyal Redensity, Teosyal Redensity II, undereye filler, 熊貓針, 黑眼圈.